sabi endeavors to give back to the collective community by working with groups from all over the world who are socially responsible in and for their communities--below are but a few examples of these organizations. At the foot of the rising ground forming the western wall of Kenya’s magnificent Great Rift Valley lies the tranquil farming community of Njoro. Here Kenyan women gather wool from the Kenana Farm and all neighboring farms as the need demands. They wash, dye with all natural plant dyes and mothproof with natural pyrethrum flower (like a daisy) all of the wool and then spin it on old bicycle wheels. Then they make unique and precious hand-knit animals. Their profits have funded a free gynecological clinic with HIV and AIDS testing for all the women, education for their children and a literacy program for the women. CFM is a social enterprise based in New Dehli, India, whose mission is to create income for the artisan communities in rural India by working directly with the community, reducing the levels in the supply chain and increasing the sustainable income for the individuals. These artisan communities produce, among many other things, the cotton Fair Trade bag sold at sabi. In addition to international marketing support, CFM trains groups in the importance of quality, enabling artisans to create internationally-marketable goods. Producers range from individual entrepreneurs, to womens’ groups, to community development organizations who implement projects to improve the lives of street children. 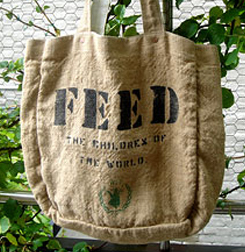 The Feed the Children of the World project was started in 2006 when Lauren Bush designed a bag to benefit the United Nations World Food Program’s (WFP) School Feeding operations. Lauren, a WFP Honorary Spokesperson who has visited eight WFP food aid operations around the world, was inspired by the plight of the people she met on her travels. 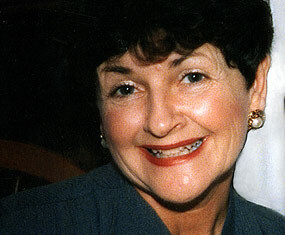 She took a special interest in WFP’s School Feeding program, which feeds and educates hungry children. The purchase of this bag feeds one child for one school year. sabi believes in this extraordinary nonprofit which works to create a world of peace and sharing . . .
A world of communities living together in peace and equitably sharing the resources of a healthy planet. To “pass on the gift.” As people share their animals’ offspring with others – along with their knowledge, resources, and skills – an expanding network of hope, dignity, and self-reliance is created that reaches around the globe. This simple idea of giving families a source of food rather than short-term relief caught on and has continued for over 60 years. Today, millions of families in 128 countries have been given the gifts of self-reliance and hope. Handcrafted in Cambodia, these unique recycled bags are made from old fish and rice bags originally headed for the landfill. These beautiful and fun fashion accessories include wristlets, cosmetic bags, market bags, messenger bags and several varieties of totes. Each product sold provides a sustainable living to the Cambodian weavers and producers who make these bags. Most are female heads of households, disabled due to polio or landmine injury, and young women rescued from brothels and taught a trade. When you became a friend of Mel Simmons, you became a friend for life. She considered you not only a friend but an extended part of the family. This was also true for the many doctors, nurses and patients she came to know while receiving treatment for metastatic breast cancer at the Massachusetts General Hospital Cancer Center. A fellow flight attendant brought Mel a handful of colorful bracelets from abroad. Mel delighted in giving them away to the staff and other patients. People began asking to buy them for others and soon "Mel's bracelets" began. After she lost her battle to breast cancer, a group of her friends decided to continue to sell the bracelets to keep funding the research and support that helped Mel survive for five years. Today the Friends of Mel Foundation provides two styles of colorful bracelets which are sold at sabi. All the money from these bracelet sales goes directly to the Foundation. It is the mission of the Friends of Mel Foundation to raise money for cancer. The Foundation funds creative and promising projects that impact patient care at both the grassroots and institutional levels. Areas of greatest interest are research, education, awareness, prevention and patient support. Indigenous Mayan women in San Cristobal de las Casas (Chiapas, Mexico) create small woolen animals using only natural sources. They are part of the Tzotzil community of Mayan people who have fought to maintain their own culture and heritage. Everything about the little animals is handmade--the thread is hand-dyed and then woven using ancestral looms. Colors come from natural sources like minerals, flowers and insects. From the sale of these creations, the women are able to earn a living which provides food for their families and which has contributed to the development of safe water facilities for their villages.